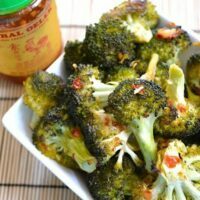 Sambal, a chunky chili and garlic sauce, makes this roasted broccoli extra flavorful! Preheat the oven to 425 degrees. Cut the broccoli into “two bite” sized pieces. If the broccoli is cut too small, it may dry up too much in the oven. Too large and you’ll need to cook it longer. In a large bowl (big enough to hold all of the broccoli), combine the vegetable oil, sesame oil, sambal, garlic, and brown sugar. Stir until it is evenly combined. Add in the broccoli florets and stir until it is well coated in the sambal mixture (stir longer than you’d think and it will eventually coat the broccoli well). Spray a baking sheet with non-stick spray and then spread out the seasoned broccoli florets so they are in a single layer. Sprinkle the broccoli generously with salt. Roast in the oven for 25 minutes or until the broccoli is just softened but is still crisp in the center. The edges will be browned and slightly wilty. Eat it up!